When people talk about Dubai, they immediately associate the city with high rise buildings, spectacular landscapes and endless luxury. Indeed Dubai is a global hub for finance and transport, it is the largest emirate in United Arab Emirates in terms of populations. Emirates founded in 1985 is the flagship carrier in UAE based in Dubai, it has been voted Airline of the Year in 2013 and serves 78 countries across 142 cities. 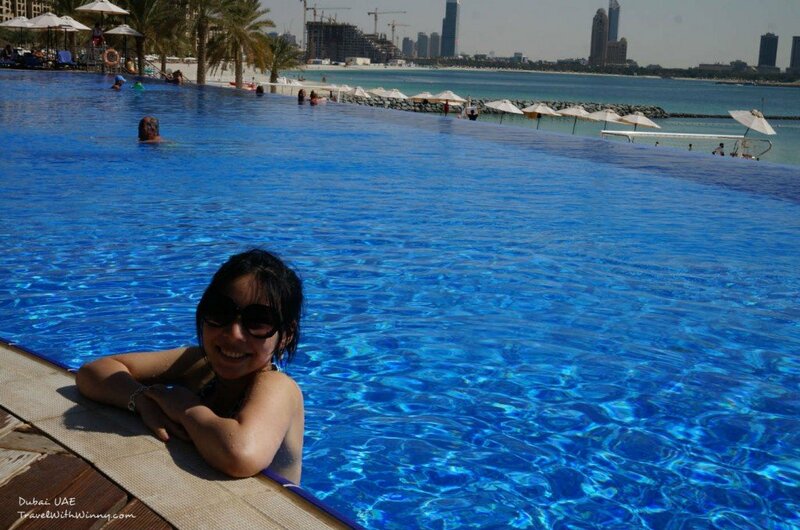 On one of the Palm Islands, looking over Dubai’s skyline at a private beach club. Emirates is actually one of the few airlines departing from Adelaide that only requires one stopover in Dubai to reach Europe, since it co-shares with Qantas as well, it has become our go-to airline when we heading towards that way. Good thing about Emirates is that they always make sure the staffs on the plane are multi-lingual, so you will have a language barrier. The food and services are superb too. Once I had a piece of steak from Auckland to Sydney flying Emirates, that steak was a better steak than some restaurants. However the food on flights from Dubai onwards may taste different, since it’s a different type of cuisine, nevertheless it was still nice. It probably takes less than a week to finish all the sight-seeing attractions around Dubai (unless you want to visit other Emirates). 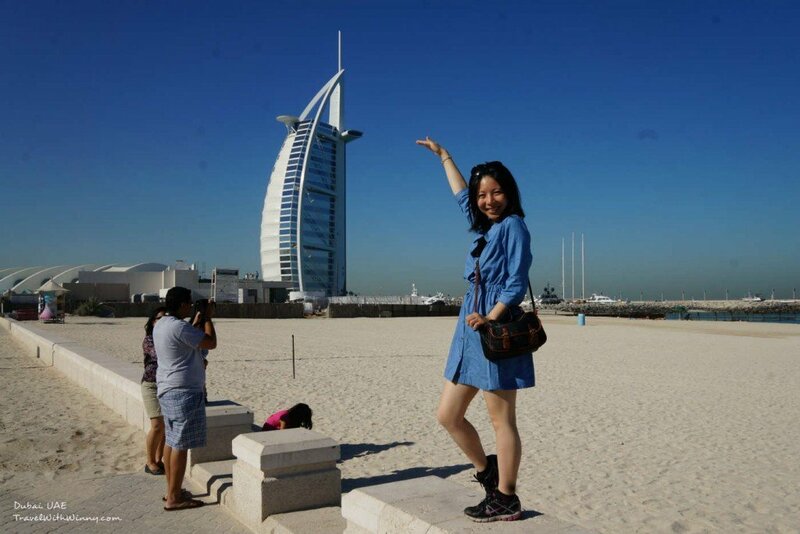 Therefore depending on where you are travelling from, I think the best way to visit Dubai is do it when you transiting and give a few days to explore this place. I won’t recommend anyone flying all the way from Australia/ New Zealand just for Dubai unless you are into luxury shopping and indulging experiences (have to have unlimited money to do that in Dubai). 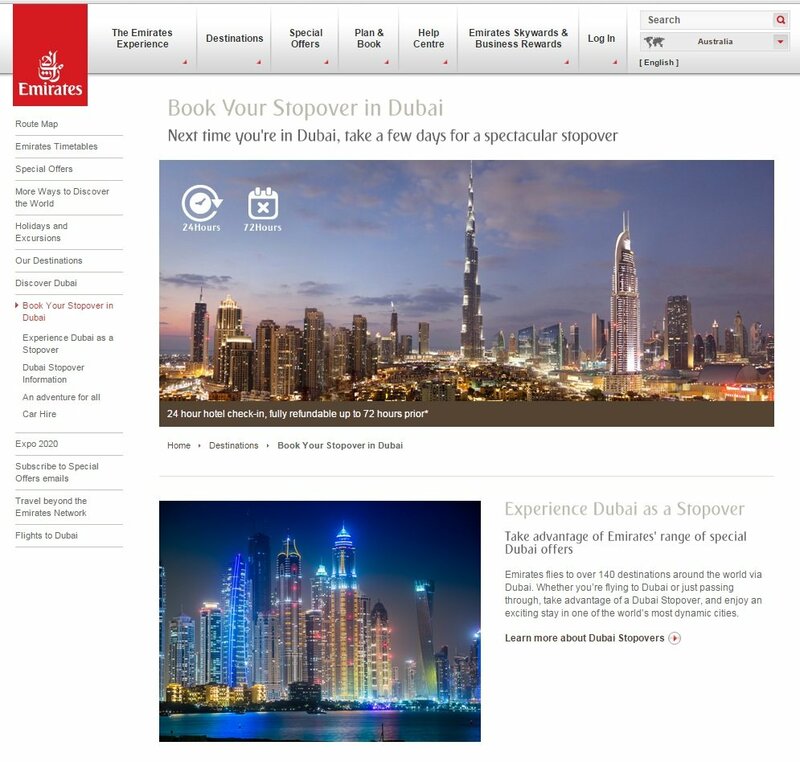 When you are flying with Emirates, you have the option of “Book your stopover in Dubai (direct link)” on their website. Alternatively you can also call your local Emirate office for all the information you need. The emirates website with information on transferring in Dubai. I think what makes this package special is the 24 hour check in/ check out. The hotel day rate is calculated by 24 hours, not the traditional method where the day rate is based on check in at 3pm and check out at 10am the next day. For example, our flight into Dubai was 2am on Monday, leaving on Thursday at 11pm. If we go by the traditional method, we will have to book the hotel for Sunday night as well in order to stay on the first night. We will also need to check out at 10am and stay out till departure time. This will cost us 4 nights in total. However by using 24 hours check in/ check out, the 24 hours only started when we arrive in Dubai, so for four 24 hours stays we were able to stay in the hotel right until we have our flights. Meaning we were able to nap a bit after dinner before we head out to the airport at 9pm for our 11pm flight. If we were going to stay in the hotel until just before our departure using our traditional method, we would have to pay for the 5th night. Mövenpick Hotel The lobby of Ibn Battuta Gate. The hotel we stayed in was called Mövenpick Hotel Ibn Battuta Gate (official website), it is a 5 star accommodation with private beach access on the Palm Islands, fine dining restaurants at the lobby and adjacent to Ibn Battuta Shopping Mall which includes a large supermarket to stock up your daily needs. The room rate on hotels.com for a Deluxe Double Room is approximately AUD$300, we paid just over AUD$240 with all the extra perks such as airport transfer and 24 hour check in/check out. 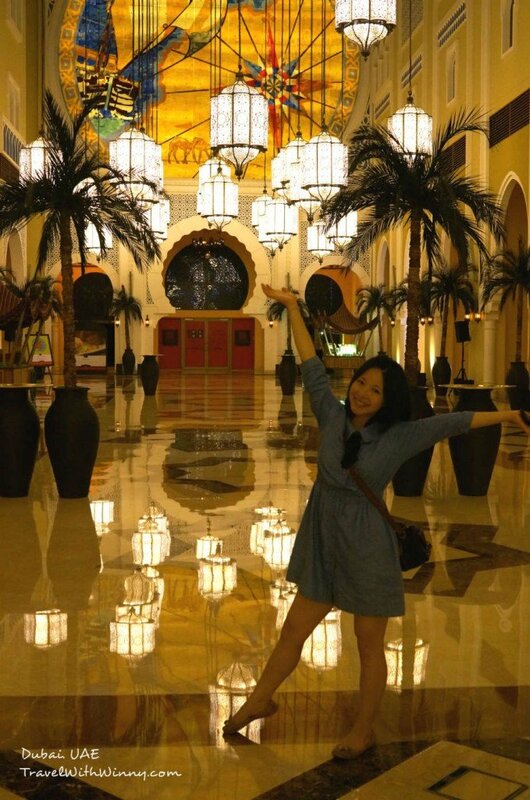 We couldn’t fault our stay at Mövenpick Hotel Ibn Battuta Gate, if we were to go back to Dubai, I would love to stay here again. I will be making a separate review about this hotel. Oceana the private beach club on The Palm Jumeirah with access to private beaches. Emirates also works with (Arabian Adventures) so you can book your tours in advance. The only tour we booked through them was called “City of Merchants”. We spent half a day going through old part of Dubai including the visit to Dubai Musuem, crossing Dubai Creek on a boat and even a photo stop for Burj Al Arab next to the beach. It was around AUD$50 per person, which I think was very reasonable. 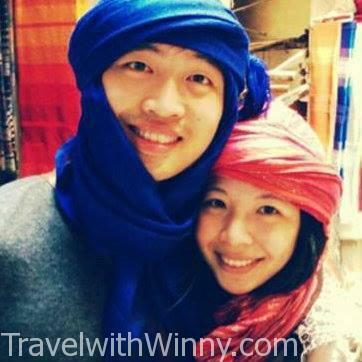 There are also other tours such as day trip to Abu Dhabi and a night in the desert. We would’ve been very interested to do the desert camp tour since we heard good things about it from friends, however we already just came back from Sahara Desert the week prior to Dubai, so we gave it a miss. Just read your blog and found it very useful. Planning to stop by Dubai for 3 nights after visiting Maldives. I have a question, for the hotels do I have to book at a specific hotel days prior to our arrival or we will decide as soon as we get to Dubai? Hi John. Thanks for your comment. Yes I do believe you will have to book before arrival as the stop-over package includes airport transfer. I do believe you need to organize this directly with Emirates though, please visit https://www.emirates.com/english/destinations_offers/dubai_stopovers/dubai-stopovers for more information, hope this helps. Hi, great post. Considering doing a stop-over but still confused about how this works. Do I book my flight then add the stop-over? I’m traveling from Cape Town, South Africa to New York, changing planes in Dubai. We’d like to spend 2 days in Dubai, but not sure if I book the Cape Town -> JFK route, then call to add the stop over, or book the Cape Town -> Dubai, Dubai -> JFK route individually (much more expensive to book that way, BTW). Hi Kris. Thanks for your message. 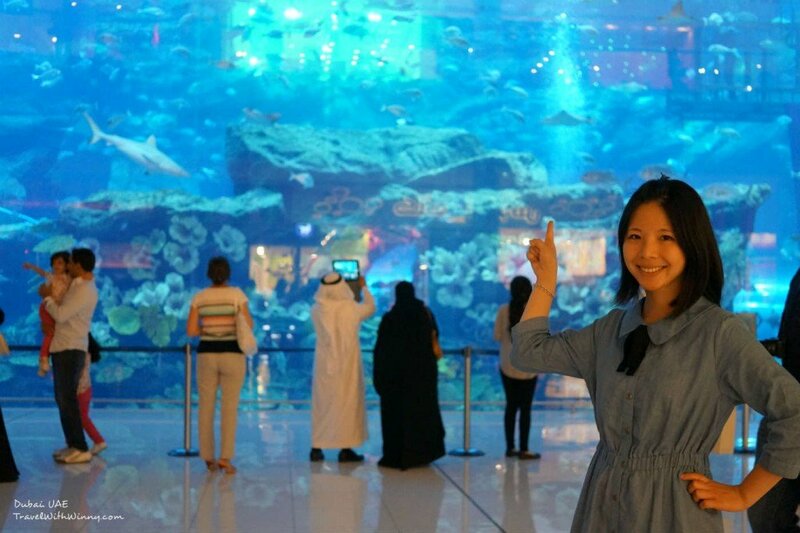 I believe in order to utilize the Dubai stop-over deal you will actually need to have a stopover in Dubai. Which means you probably need to book Cape Town to JFK route. If you are doing it through an agency I am sure they can extend your transit…However, if you book it online yourself, I am not sure if you can book extended transit… I would actually call Emirates office in your city, ask them for their opinion and see what they say. They can probably give you more accurate information than I can. I actually booked the tickets online myself and called Emirates once we started the trip (we were going to Dubai on our way back) and changed our flights to extend our stay.